We’d love your help. Let us know what’s wrong with this preview of Purification of the Heart by Imam al-Mawlud. To ask other readers questions about Purification of the Heart, please sign up. Im not a big Hamza Yusuf fan, there are many things he says that I dont really settle with but as this was a translation of a book and I think he has decent arabic masha'Allah I decided to give it a go. Im glad I did!! I read it with an online group, making notes as I went along. I learnt many things from the book and felt like a more peaceful calm person after reading it :) There was so many references and ahadith to back up the things he was saying. It contains many paragraphs on totally relate Im not a big Hamza Yusuf fan, there are many things he says that I dont really settle with but as this was a translation of a book and I think he has decent arabic masha'Allah I decided to give it a go. I'm speechless when it comes to this book. I loved the book so much such that when I misplaced the book and I thought I've lost it --it was for almost a year until I found it back-- I was so distressed; especially at that time they haven't reprint the book and everywhere is out of stock already. This book has the potential to change your life--the way you think, the way you act, etc. I wish I had read it before or while I was in college--it would have saved me quiet a bit of grief. But better late than never. No need to sit around the self-help section of Barnes and Nobles--this book pretty much has everything you need to improve your relationship with God and humankind. I read this book in two days. It delves into religious spirituality on how to clean your heart, and keep it free from, envy, hatred and arrogance. It also talks about how to control heavy thoughts that effect our mood and heart. For people interested in spirituality this books is a guide to good thoughts and happy thinking. One feels good after reading it, as the messages are sincere and toward becoming a better person. a person of patience and tolerance and good thoughts. Beautifully written th I read this book in two days. It delves into religious spirituality on how to clean your heart, and keep it free from, envy, hatred and arrogance. It also talks about how to control heavy thoughts that effect our mood and heart. For people interested in spirituality this books is a guide to good thoughts and happy thinking. Purification of the heart is a responsibility of every Muslim. Either you are doing well and wish to safeguard your pure heart, or your heart is ill and requires purification. If you think your heart is already pure and doesn't need purification, then your heart is most likely ill and needs the purification from the inherent arrogance. This is a wonderful book that I shall read again and again for it's tremendous benefit! IF WE TRIALS AND TRIBULATIONS all over earth, we'll find they are rooted in human hearts. Covetousness, the desire to aggress and exploit, the longing to pilfer natural resources, the inordinate love of wealth, and other maladies are manifestations of diseases found nowhere but in the heart. Every criminal, miser, abuser, scoffer, embezzler, and hateful person does what he or she does because of a diseased heart. So if you want to change our world, do not begin by rectifying the outward. Instead, change the condition of the inward. It is from the unseen world that the phenomenal world emerges, and it is from the unseen realm of our hearts that all actions spring... We of the modern world are reluctant to ask ourselves - when we look at the terrible things happening - "Why do they occur?" And if we ask that with sincerity, the answer will come back in no uncertain terms: all of this is from our own selves. In so many ways, we have brought this upon ourselves. This is the only empowering position that we can take. 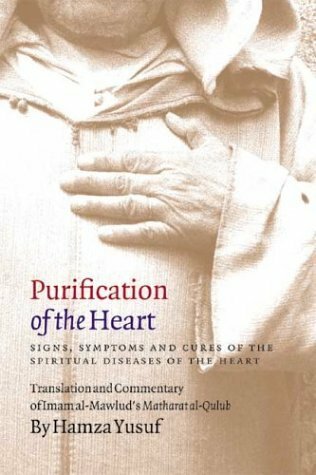 This book offers an insightful introduction to one of the most ancient of religious concerns: spiritual purification of the heart. It takes the reader through a well-known text from the Muslim tradition, and gives important commentary that is relevant to our day and to people of a variety of religious experiences. 'Purification of the Heart" is easy to follow, well-structured and profound in its advice. Hamza Yusuf not only translates Imam Mawlud's poem, but adds an insightful commentary that draws upon experiences with which we can all relate in this modern day and age. The chapters are bite-sized and all contain relevant references from the Qur'aan and Hadith that provide us with practical solutions to our tribulations. It emphasises the Islamic principle of starting with rectifying the self before wanti 'Purification of the Heart" is easy to follow, well-structured and profound in its advice. Hamza Yusuf not only translates Imam Mawlud's poem, but adds an insightful commentary that draws upon experiences with which we can all relate in this modern day and age. The chapters are bite-sized and all contain relevant references from the Qur'aan and Hadith that provide us with practical solutions to our tribulations. It emphasises the Islamic principle of starting with rectifying the self before wanting to change the condition of others around us. A good book for self introspection not only for Muslims but also non Muslims. However, having said that the book has a major short coming in that it identifies spiritual diseases very well but does not always give adequate solutions for the cures. I am not a proponent of Sufism and this book is seemingly geared for the Sufi reader, which is a flawed assumption. Spiritual ailments befall every single human alike, and it is not just the Sufi who seeks a cure from them. As a pragmatic and non-mystic A good book for self introspection not only for Muslims but also non Muslims. However, having said that the book has a major short coming in that it identifies spiritual diseases very well but does not always give adequate solutions for the cures. I am not a proponent of Sufism and this book is seemingly geared for the Sufi reader, which is a flawed assumption. Spiritual ailments befall every single human alike, and it is not just the Sufi who seeks a cure from them. As a pragmatic and non-mystical Muslim, I found that I was aware of most, if not all of the concepts presented in the book and even though it served to reaffirm many issues, I did not always see pragmatic spiritual excercises for betterment. I only came across prayers at the end of the book. The prayers mentioned are the standard prayers and I am afraid prayer alone does not do much unless one takes concrete steps to address spiritual ailments such as anger and sloth etc. This book will be one of my top favorites. Such a profound and an enlightening book. One of those books that everyone should read and definitely re-read throughout life. I have to purchase my own copy. Many are concerned with their physical looks and appearance. One knows how to consult a doctor when they are unwell. but not much knows how to seek treatment when their hearts are unwell. Unraveled in a systematic manner this book I found it to be a key tool for a person to transform themselves from the inside out. It changed me as a whole. It changed my life and even my perspective. Great book! Change begins within. When the heart heals the body does too. Imam Hamza Yusuf is one of America's most famous Imams, and a Sufi. He is well versed in the Arabic language and various Sufi lineage of tariqat (pathways for students of Sufism). This book goes over the pitfalls in life and the biggest challenges to avoid... because the bad we do is like a blackspot on our heart... he comes up with symptoms and cures for these diseases. A very good read, but better if reading a few chapters, then continuing after a night or two. It's pretty spiritually heavy. I LOVED this book...and it has an amazing list of some great supplications to get you to think of God throughout the day! Shaykh Hamza Yusuf has his own style of writing. Very unique. He can relate certain things or issues with sciences, poetry, philosophy and linguistics. Plus, most of his commentaries are quite related with what is happening in our world and ourself. "Kalbin Simyası: Manevî Yaralara Çare Bulmak", "manevî boşluk" gibi kavramlarla karşılanmaya çalışılan günümüzün trendi kişisel gelişim arayışlarının asıl sebebine eğiliyor, bu nedeni "kalbin manevî hastalıklara yakalanması" olarak ele alıyor. İnsanoğlunu bu boşluğa sürükleyen asıl sebep, manevî dayanak noktalarının kaybolarak nefsin isteklerinin iyi yönlendirilemeyip kalbin kibir, cimrilik, düşmanlık, şımarıklık gibi birçok olumsuz özellik tarafından kuşatılmış olması. İşte Hamza Yusuf, bu hast "Kalbin Simyası: Manevî Yaralara Çare Bulmak", "manevî boşluk" gibi kavramlarla karşılanmaya çalışılan günümüzün trendi kişisel gelişim arayışlarının asıl sebebine eğiliyor, bu nedeni "kalbin manevî hastalıklara yakalanması" olarak ele alıyor. İnsanoğlunu bu boşluğa sürükleyen asıl sebep, manevî dayanak noktalarının kaybolarak nefsin isteklerinin iyi yönlendirilemeyip kalbin kibir, cimrilik, düşmanlık, şımarıklık gibi birçok olumsuz özellik tarafından kuşatılmış olması. İşte Hamza Yusuf, bu hastalıklara, çok önemli bir âlim olan İmam Mevlüd'ün şiirsel eserinden yola çıkarak tanı koyup onları teşhis ediyor ve bu manevî rahatsızlıklara yönelik tedavi yöntemleri öneriyor. Fiziksel kalbimiz ile manevî kalbimiz aslında aynı yönde ilerler, fiziksel kalp ne kadar sağlıklıysa manevî kalp de yeme içme gibi rutinlerdeki adaba uygunlukla o denli sağlıklı olur ve yine, manevî kalp sağlıklı tutulursa fiziksel kalp hastalıkları da o denli azalır. İslamî geleneğe yaslanan bu metin, "korku"dan ziyade "umut" vâdetmekle birlikte, okuru, bir kul, hataları olan bir Âdemoğlu olarak, noksan noktalarının farkına vararak içsel boşluğunu doldurma yönünde adım atmaya teşvik ediyor. Değindiği disiplinlerarası noktalarla da birçok sosyal bilim koluna kitap ediyor. Hamza Yusuf, Amerika Birleşik Devletleri'ndeki ilk Müslüman beşerî ilimler üniversitesi olan Zaytuna College'in kurucusu, dünya çapında bilinen, hatrı sayılır takipçileri olan, dinî meseleleri samimiyetle, araya bir ulema-halk ayrımı koymadan anlatabilen bir İslam âlimidir. On yedi yaşında geçirdiği bir trafik kazasından sonra hayatının anlamını sorgulamaya başlayarak bu sürecin sonunda Müslüman olmuş, hayatını, dünyanın birçok ülkesini dolaşarak İslam'ı ve onun güleryüzünü, kapsayıcılığını anlatmaya vakfetmiştir. Halihazırda çalışmalarına devam etmektedir. Türkiye'de de hatrı sayılır bir takipçi kitlesi bulunan Hamza Yusuf, ülkemize de gelerek program yapmıştır. I've heard the audio lecture of this book before so it felt like I was rereading the text, which gave greater familiarity when reading it. The book comprise of Imam al-Mawlud poetry on the Heart which's derived from Imam Al-Ghazali's great Ihya Ullumuddin. The book translates the Poetry and then details its discussions regarding the issues and ramifications to the spiritual Heart. It then tries to outline the steps to be taken to cure or rectify the predicaments. I greatly enjoyed this book and wi I've heard the audio lecture of this book before so it felt like I was rereading the text, which gave greater familiarity when reading it. I greatly enjoyed this book and will study it in the next read with proper highlights and footnotes. I recommend Muslims to study this too as to understand Islamic practices from a contemplative spiritual side rather than stringent haram-policing that is often practiced today and which in my opinion one of the reasons contributive to our current condition. Gandhi's quote read; "If you want to change the world, start with yourself". And. "There is no love, if there is no heart". a Journey through your heart, the ebb and flow, the Poem and the later explanation by Sheikh Hamza Yusuf is one of kind, he tackles every thought or shred of a thought that you may have went through during your encounter with any of those diseases, the book is well written and divided, it's written in separate chapters so you can jump from one to another easily, though it's highly recommended to read the whole book, Ending the book with the chapter on Ramadan and text of Sheikh Ahmad Zurruq made it even better ! Just as the DSM-5 is currently the manual for diagnosing mental illnesses, I like to think "Purification of the Heart" is the manual for diagnosing our spiritual illnesses. And a manual is not something you read once, but you keep going back to it checking and re-checking. Halfway through the book I started reading Why I Am Not a Muslim. As you can tell, these two books had as many conflicting ideas as possible. In Ibn Warraq's book, many instances are shown to tell the readers how much of an immoral person Muhammad was. However, in this book he is depicted as the most perfect human being, "the best of the sons of Adam"—as I would assume every Muslims think of him to be. If the traditions the author, Hamza Yusuf, mentioned are true, then Muhammad sure had a confli Halfway through the book I started reading Why I Am Not a Muslim. As you can tell, these two books had as many conflicting ideas as possible. In Ibn Warraq's book, many instances are shown to tell the readers how much of an immoral person Muhammad was. However, in this book he is depicted as the most perfect human being, "the best of the sons of Adam"—as I would assume every Muslims think of him to be. If the traditions the author, Hamza Yusuf, mentioned are true, then Muhammad sure had a conflicting personality—taking into account what some scholars of Islam say about him. Anyway, coming back to the book. The first objection I had with this book were the unsupported claims, but it wasn't surprising that it was unsupported because it wasn't a book that needed to be cited. Yet we also know that the nervous system does not initiate the beat of the heart, but that it is actually self initiated, or, as we would say, initiated by God. We also know that the heart, should all of its connections to the brain be severed (as they are during a heart transplant), continues to beat. I understood in the very beginning that the book was for the believers, so I am not going to criticize it for prescribing the fear of hereafter, Allah, verses from the Qur'an and Hadith as remedies. If I knew it was a book only for the believers, I doubt I would have picked it up, but I was suggested by a friend to read it. The purpose of the book, I guess, is to make people understand how they're not doing good to their spirit by committing various acts such as having hatred, anger, and being a fraud and arrogant etc. The remedies are simple: Fear Allah, think about your reality and what will happen to you after you die, follow the sunnah of the prophet and his companions. Since the cure was almost the same, the book was redundant in a sense. It wasn't an enjoyable read for me—but that probably happened because Allah doesn't guide the disbelievers—however, it might be of great help for a believer. I skipped through most of the pages and didn't bother to read the appendix at all. I was ambivalent regarding what rating I should give this book. So I took back the two stars rating that I gave it initially and refrained from rating it at all. However, I am confident that these "diseases" can be cured without the help of a divine being and fear of the hereafter, as it is shown in various books on meditation, such as this amazing book by Jon Kabat-Zinn—Wherever You Go, There You Are. January pick for monthly Islamic book project. In 2017 I am trying to read one Islamic spirituality book per month, as I find it easy to neglect spiritual growth with a 9-5 job and all of that. This was my pick for January. Not much needs to be said - I think it's obvious from the description - except that the appendices are lovely, and I recommend reading those as well. It's clearly one of those books one has to go back and re-read periodically, as purification of the heart is a never-ending tas January pick for monthly Islamic book project. I read it again for the 3rd time. It`s more than a book, I absolutely love everything related to this book. A great inspiration, a lot of exercises for ur heart and mind, a lot of conclusions and lessons , written in such a profound way, I will repeat, that`s more than a book. I would recommend it for anyone who wants to keep his/her heart and brain healthy through reading. I read it again for the 3rd time. It`s more than a book, I absolutely love everything related to this book. A great inspiration, a lot of exercises for ur heart and mind, a lot of conclusions and lessons , written in such a profound way, I will repeat, that`s more than a book.